Form TD1ON is a Ontario Ministry of Finance - issued form also known as the "Ontario Personal Tax Credits Return". A PDF of the latest Form TD1ON can be downloaded below or found on the Ontario Ministry of Finance Forms and Publications website. Read page 2 before filling out this form. Your employer or payer will use this form to determine the amount of your provincial tax deductions. Fill out this form based on the best estimate of your circumstances. 1. Basic personal amount – Every person employed in Ontario and every pensioner residing in Ontario can claim this amount. If you will have more than one employer or payer at the same time in 2018, see "More than one employer or payer at the same time"
Form TD1ON-WS, Worksheet for the 2018 Ontario Personal Tax Credits Return, and fill in the appropriate section. annual pension income, whichever is less. 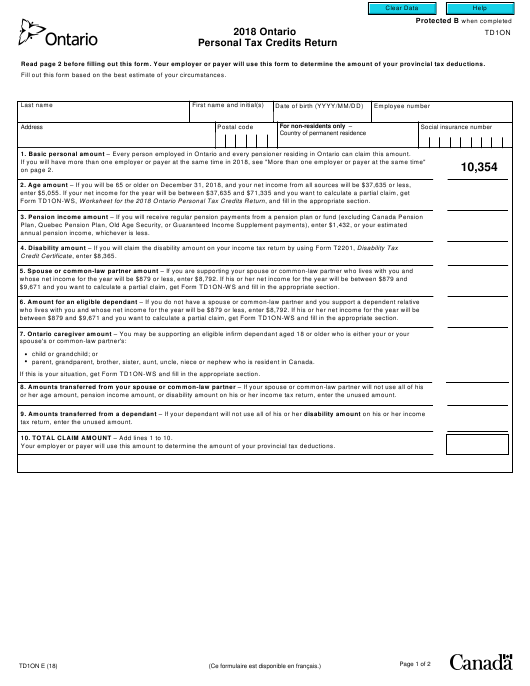 $9,671 and you want to calculate a partial claim, get Form TD1ON-WS and fill in the appropriate section. between $879 and $9,671 and you want to calculate a partial claim, get Form TD1ON-WS and fill in the appropriate section. parent, grandparent, brother, sister, aunt, uncle, niece or nephew who is resident in Canada. If this is your situation, get Form TD1ON-WS and fill in the appropriate section. or her age amount, pension income amount, or disability amount on his or her income tax return, enter the unused amount. tax return, enter the unused amount. 10. TOTAL CLAIM AMOUNT – Add lines 1 to 10. Your employer or payer will use this amount to determine the amount of your provincial tax deductions. you want to increase the amount of tax deducted at source. Sign and date it, and give it to your employer or payer. If you do not fill out Form TD1ON, your employer or payer will deduct taxes after allowing the basic personal amount only. TD1ON, check this box, enter "0" on line 10 and do not fill in lines 2 to 9. Check this box if your total income for the year from all employers and payers will be less than your total claim amount on line 10. Your employer or payer will not deduct tax from your earnings. If you wish to have more tax deducted, fill in "Additional tax to be deducted" on the federal Form TD1. deducts RRSP contributions from your salary. To get our forms and publications, go to canada.ca/cra-forms-publications or call 1-800-959-5525. Info Source at canada.ca/cra-info-source, Personal Information Bank CRA PPU 120. I certify that the information given on this form is correct and complete.